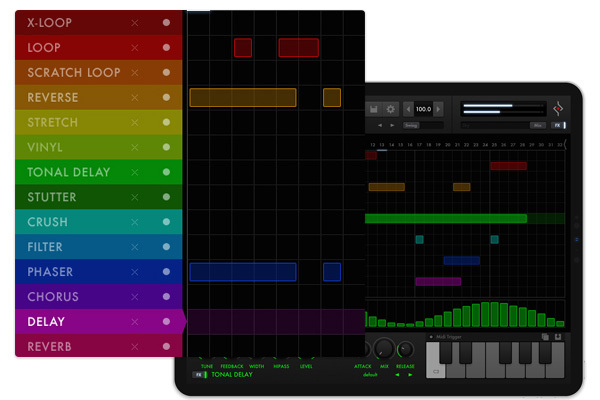 Effectrix for iPad | Multi-Effect Looper for professional mobile Production. 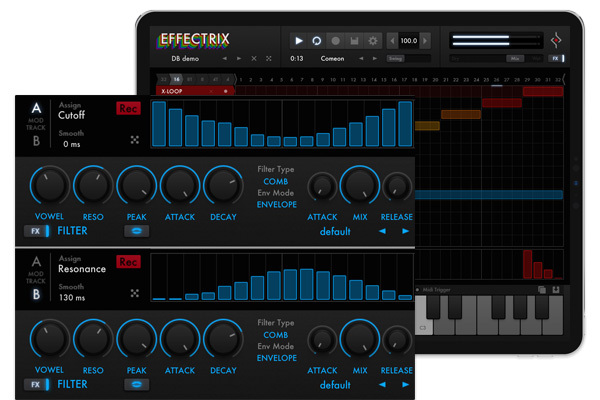 Effectrix brings time-synced, high-quality audio manipulation to your touch screen studio. A playful workflow, refined algorithms and carefully parameterised effects lead to outstanding results - fast! The effects, each exceeding conventional wisdom, cover a wide spectrum from classy standards to scandalising splatter sprees. A motley crew of 14 top-quality effects, well designed and innovative each and everyone of them are distributed over the sequencer matrix. Start mixing them, paint the matrix and the magic of Effectrix begins. The playful approach creates an athmosphere of immediacy and intuition. The abundant factory presets & randomizers, the familiar structure of a sequencer will assist and channel your creativity. Most of all: it sounds good. Its effects algorithms excel the often limited creative potential of conventional multi-effects. 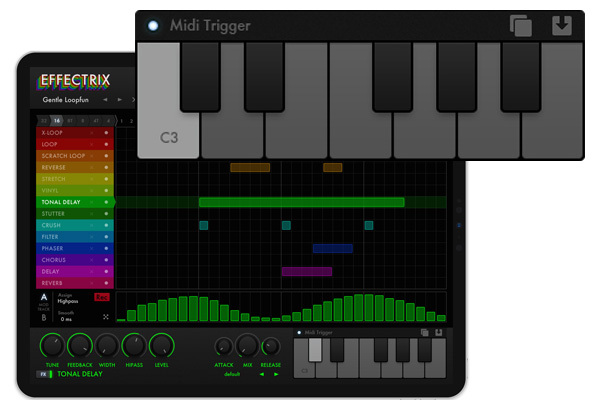 The wide spectrum possible combinations, stability and deep modulation set Effectrix apart from the competition. Each Preset can host up to 12 different effect patterns, which can be triggered via the on-screen keyboard or an external controller, so you can recall the most different setups and configurations just in time. Maybe only a small feature, but it makes Effectrix a very powerful and broad tool for performance. Add to this that any of the five parameters per effect can be linked to a hardware controller via MIDI Learn (double tap on a effect knob) and that you can create a parameter automation by twiddling with your hardware rather than tapping on the modulation strip and you have a fully fledged Live Tool with a versatility second to none. 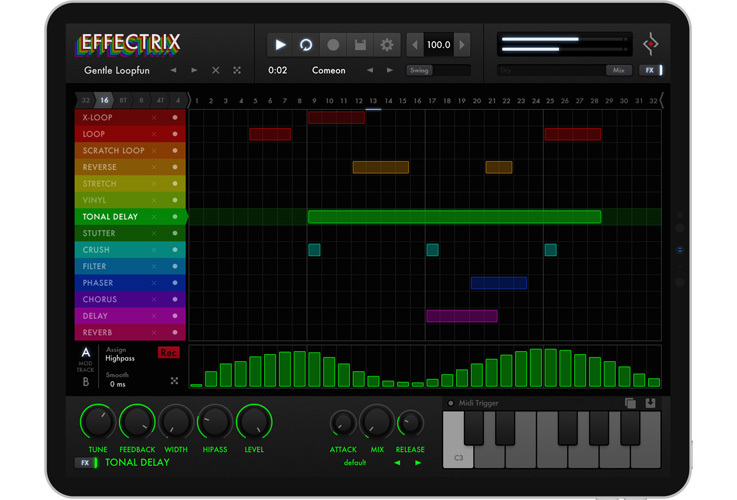 Use Effectrix to refine your beats, enrich them with scratches or give them further complexity by looping, delaying, or reverberating phrases. Using the Tonal Delay you can create melodies out of any material. The Stutter effect provides classical gating as well as sequenced panning and enveloping (working out transients). Effects like Time Stretch and per-beat Reverse Loop make it the ultimate loop mangler on iOS right now. Not just for drumloops, but anything really.